Find out how these simple restorations could revive your smile. Has our Vero Beach, FL, dentist, Dr. Raymond Della Porta, II recommended that you get a dental crown? You probably already know a little something about dental crowns, even if you’ve never gotten one before. They are one of the most commonly used dental restorations, after all, and there is a reason why. Dental crowns can do everything from altering the shape and appearance of a tooth to protecting if from irreparable damage and restoring function and strength. What types of crowns can I get in Vero Beach? It’s true that dental crowns can be fashioned from different materials. As you can imagine, the most popular crowns are made from tooth-colored materials (e.g. porcelain) because the material can be matched to the shade of your teeth so that no one will be able to tell that you have a crown. 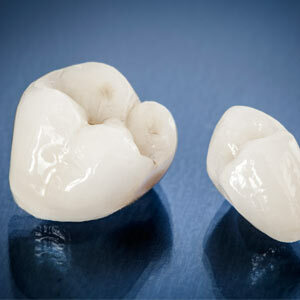 Dental crowns can also be made from ceramic or porcelain-fused-to-metal. Are you ready to say goodbye to misshapen or damaged teeth and feel confident in your smile once more? If so, then it’s time you called our Vero Beach, FL dental office to find out the many ways we can help. Restorative dentistry can give you back the smile you once had. Dental crowns protect fragile and damaged teeth, keeping your smile strong. Dr. Raymond A. Della Porta, your Vero Beach, FL dentist, shares information about the benefits of dental crowns. Strengthening Weak Teeth: Crowns protect teeth weakened by crack or chips. If you don't receive a crown, the tooth may be more likely to break when you bite into a piece of food. Providing Stability After Dental Treatments: Crowns are also recommended if a tooth requires a large filling, or you have undergone root canal therapy. Both of these treatments can weaken your teeth and make them more likely to crack or break without protection. Repairing Broken Teeth: Placing a crown over a broken tooth not only protects it from further damage but also restores it to its full height and shape. Hiding Cosmetic Issues: Crowns are an excellent choice if you're concerned about a tooth that is discolored, too short or oddly shaped. During the first visit, your Vero Beach dentist will reduce the size of your tooth slightly. This step is necessary to ensure that your new dental crown slips over your tooth easily. An impression of your mouth will also be made and sent to the dental laboratory that will create your custom-made crown. Your dentist will make a temporary crown for you, which you'll wear for about two weeks until your new crown is ready. When your permanent crown is finished, you'll return to your dentist's office. He'll check the fit of the new crown and make any necessary adjustments before permanently attaching it to your tooth with dental cement. Dental crowns offer a simple way to keep your teeth strong. Call Dr. Raymond A. Della Porta, your Vero Beach, FL dentist, at (772) 567-1025 to schedule an appointment to learn if crowns are a good option for you. Improve your smile with dental crowns!